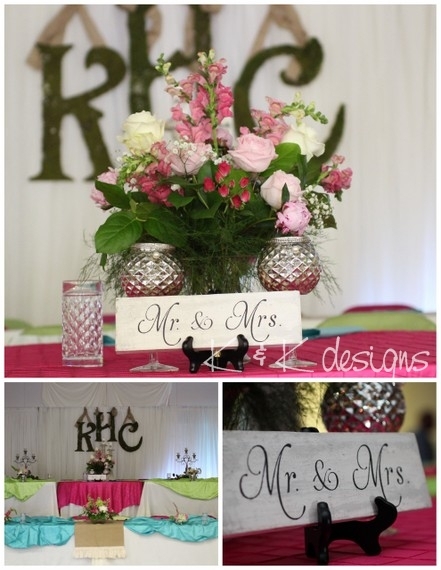 HomeCandy BarsFabulous Friday: Beautiful Pink Wedding! Happy Friday everyone, I hope you have had a great week and are looking forward to the weekend and the upcoming Fourth of July Holiday! I know we are!!! 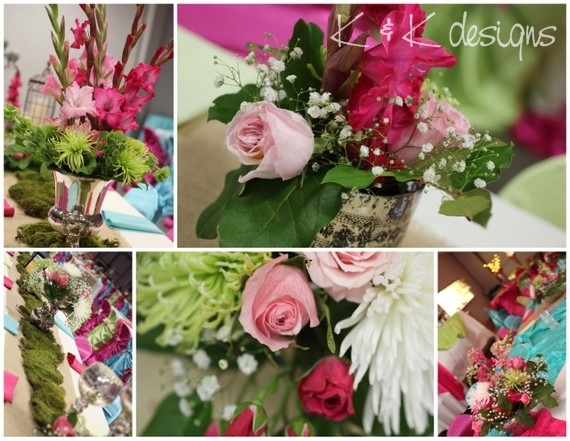 This weeks post features a beautiful pink, green and turquoise wedding that we had the pleasure of designing. When Karla came to us over a year ago she wasn’t entirely sure what she wanted. The few things that were for certain were that it was going to be grand (600 people grand), her favorite color was pink and she had her venue, the only room in her town that would accommodate that many people. Luckily for us it was a nice clean room with white walls which offered a clean slate. We knew we needed a lot to fill the massive space so the planning began! 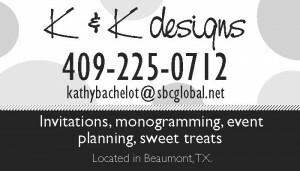 We worked on everything from save the dates and invitations to linens and flowers! A massive undertaking that we enjoyed every minute of! For the church we kept it simple with two large arrangement on the altar and used our standing lanterns as the aisle markers that we then adorned with fresh flowers. 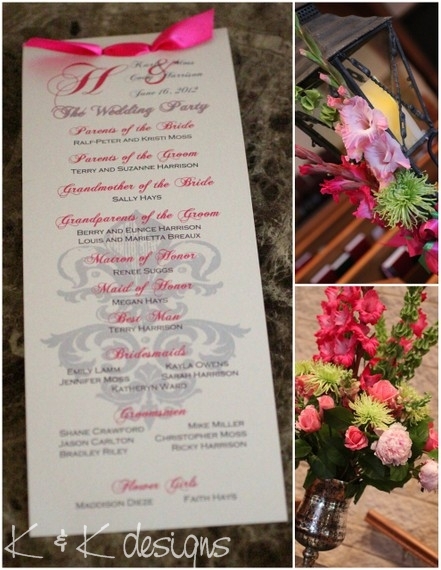 The programs were made using the same colors and fonts that we used for the invitations and save the dates. 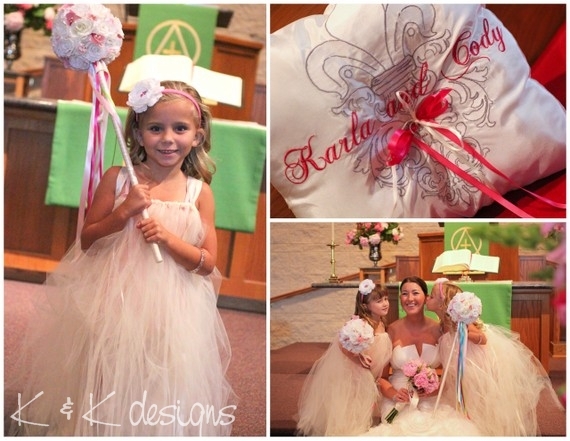 We also had the pleasure of making these beautiful tulle dresses and flower girl wands for the equally beautiful flower girls. Fair warning, flower wands can easily be used a swords, don’t say I didn’t warn you! 🙂 We also made a ring bearer pillow with the bride and groom’s logo. 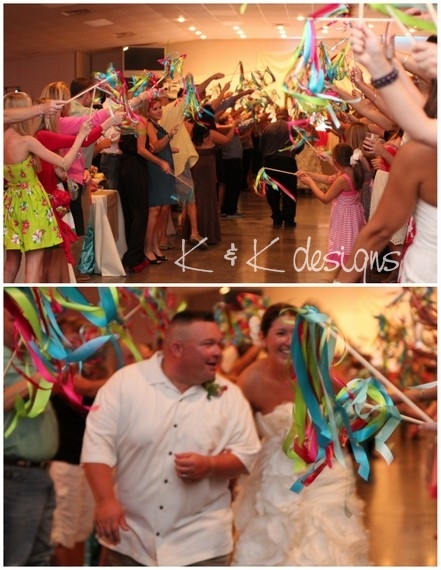 When you entered the reception you were greeted with our french flower pail stand filled with wedding wands made from the bride’s vibrant colors! 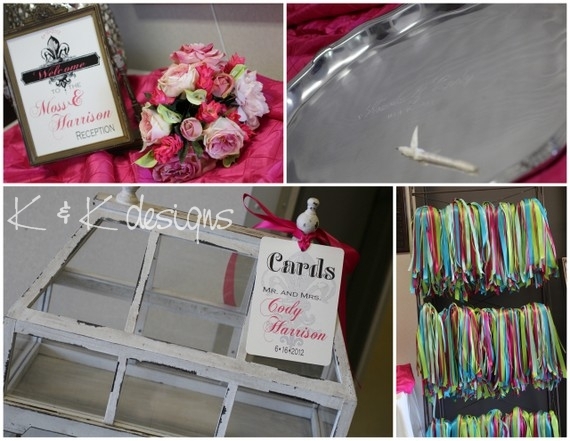 The sign in “book” was actually a pewter tray that we had the Bride and Groom’s name and wedding date engraved with. The guest then used an engraving pen to sign the tray! We used the linens as a tool to bring a lot of color into the massive white room. 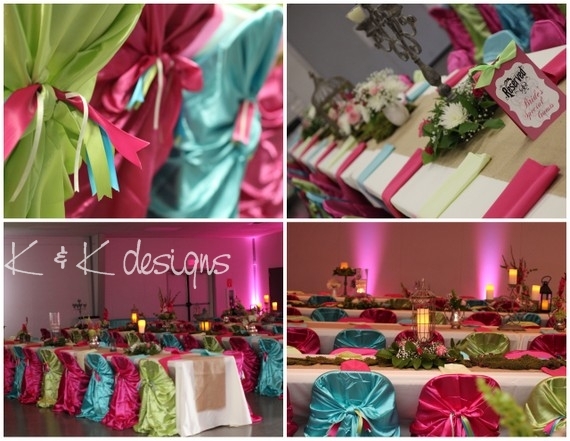 We alternated the chair covers and napkins using pink as the main color and turquoise and green as accents. The linens for the tables were ivory with burlap runners down the middle which gave a nice linear effect to the long lines of family style tables. The flowers for the wedding were one of my favorite aspects. They were pink and frilly but with an added twist of the green spider mums and hydrangea. We filled every container we could get our hot little hands on from silver teapots and sugar bowls to birdcages and lanterns. You name we put flowers on, in and around it! We also used a lot of moss (the Bride’s maiden name is Moss) on the burlap table runners and on the oversized letters that were hanging from the backdrop behind the head table. 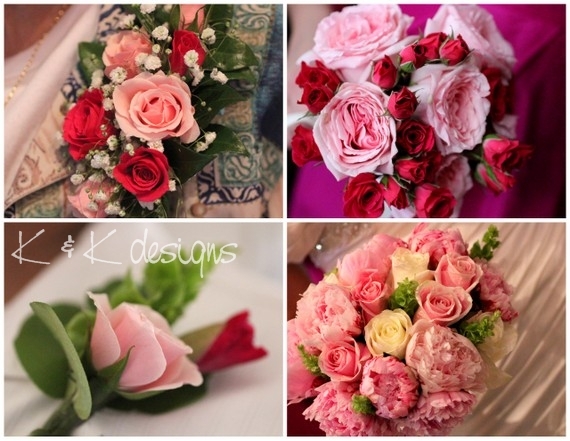 The boutonnieres, corsages and bouquets were also made from the same romantic flowers. I will be the first to admit that I am not a huge “pink fan” but I think this wedding with these flowers won me over. For the lighting we used one of our favorite vendors, JPL Entertainment, to flood the large expanse of white walls with colored lights. 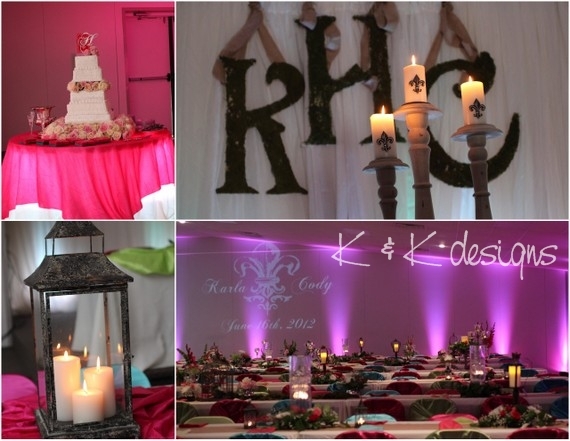 The also uplighted the cake table for a stunning effect and projected the Bride and Groom’s logo onto one of the walls. Lighting is a huge element that most Bride’s overlook but can make your event. Along with JPL’s lighting package we had tons and tons of twinkling candles throughout the venue to give it a very romantic feel. For the Bride’s cake Karla asked us to make it look like is was resting on a bed of roses so that is exactly what we did. 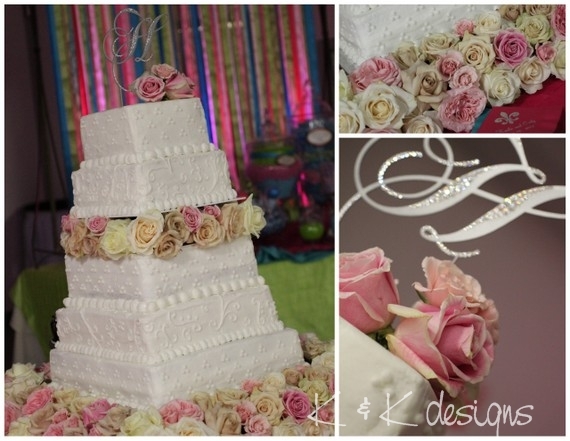 We used hundreds of white, pink and the most beautiful beige roses (I am sure they have a real name other than beautiful beige rose) I have ever seen. Actually, I have never seen roses that color before. 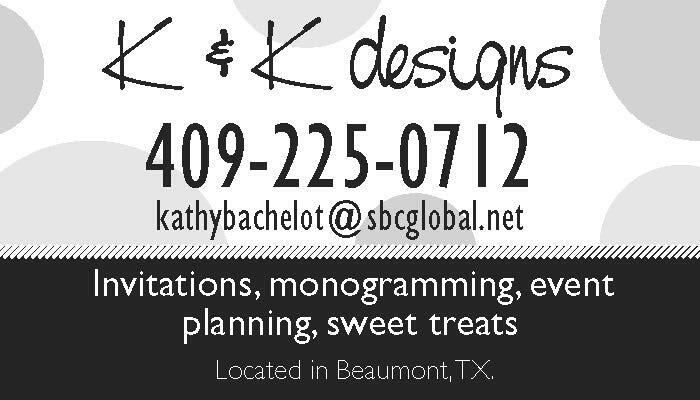 We also had a custom cake topper made for her using her new monogram that we used on her invitations, programs and all printed material for the wedding. It is really important to have all of your elements relate to one another, it ties it all in and makes it personal. I know a lot of you saw my Facebook about the Groom’s cake and let me tell you, pictures do not do it justice. Not only did it look AMAZING but it was delicious. The whiskey barrel was a whiskey cake that was Oh. My. scrumptuous. 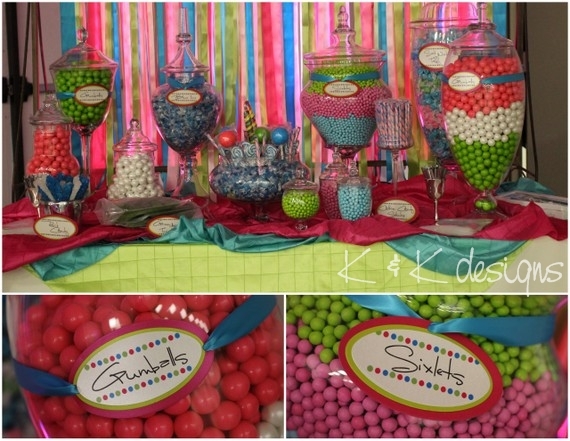 For the favors they decided to go all out for the guest and did our most popular candy buffet. That is a whole lot of candy and I am telling you it was just about all gone by the end of the night. The table was crowded the entire night. Kids young and old enjoyed it immensely. People always ask us what the wedding wands are used for so here you go! They make great pictures when you are exiting. Colorful and bright and a lot less messy than rice or bird seed. People also tend to have a lot of fun with them on the dance floor. P.S. These also make great swords! 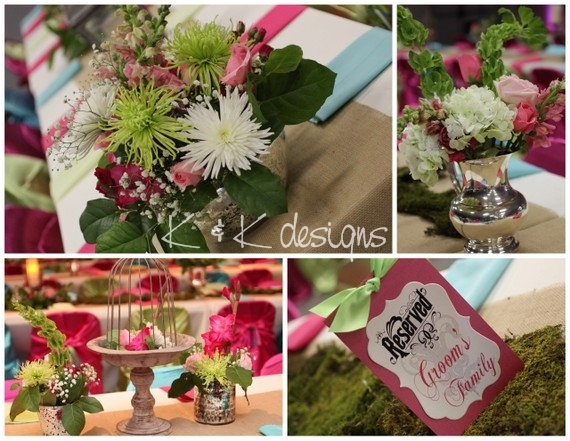 We had such a fun time planning this wedding with Karla, Cody and Karla’s Mom, Kristi. Thank you for letting us be a part of your special day and here is to many happy years as Mr. & Mrs. Cody Harrison. Wow!! Y’all did an amazing job! 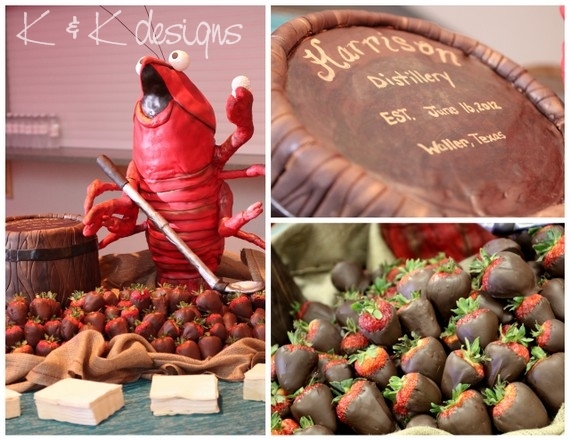 LOVE the Groom’s cake!